Heat oven to 450°F. Spoon 1/3 cup pie filling into each of six 6-oz custard cups. Remove pie crust from pouch; place crust flat on work surface. Sprinkle flour over crust. Place crust, floured side down, on cutting board or pastry cloth. With 3 1/2-inch cookie cutter, cut 6 rounds from edges of dough. Place each over pie filling. Cut slits on top of each. Sprinkle with sugar. 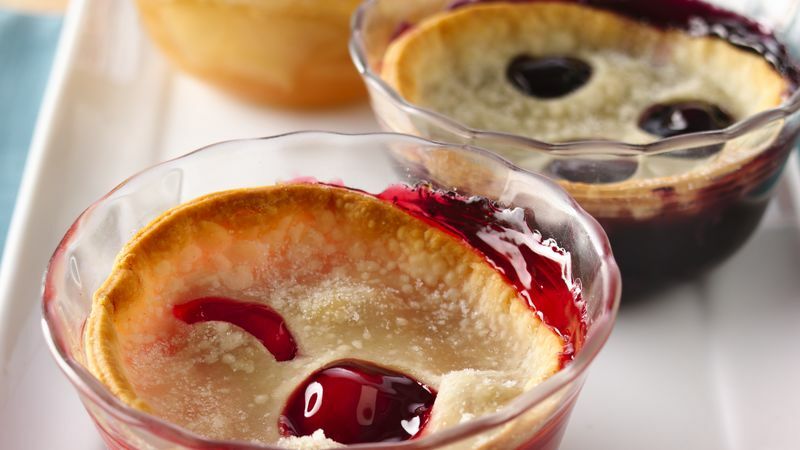 Place custard cups in 15x10x1-inch pan. Bake 20 to 25 minutes or until golden brown. Serve warm.